Valencia's comprehensive, competency-based Faculty Development Program provides a variety of opportunities, from face-to-face seminars to online and hybrid courses. Courses are uniquely designed and facilitated by Valencia experts . . . your colleagues. 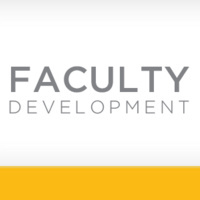 Faculty Development seeks to support all faculty members as they expand their professional practices and examine their ongoing development in the seven Essential Competencies of a Valencia Educator. The intention of Valencia's Faculty Development Program is to engage teachers, scholars and practitioners in continuous improvement processes that result in student learning. Click on the Faculty tab. Click on the Access Valencia EDGE graphic in the Faculty Development Channel. A new window will open. Scroll down and Click on Course Calendar on the bottom left.